'Bambella: This life is anything but certain. This life is anything but certain. As you may have seen here, for my birthday my lovely boyfriend Jack bought me a beautiful picnic hamper from BHS. The day after my birthday Jack and I had planned to do something as the actual day of my birthday wasn't that interesting but weren't sure what to do, so we checked the weather and as it was sunny and warm, we decided upon taking the hamper for its first outing! My mum and I went to Lidl (good ol' money saving Lidl!) to get some scrummy food and drinks and packed up the hamper full to the brim. We then set off to Crickley Hill and found a little hidden, sunny spot and set up camp. It was so lovely to just sit, eat and relax for a few hours and have a break from the list of hundreds of jobs I have to do before heading off to university. Here are just a few pictures from the day..
What I wore and waiting for Jack. 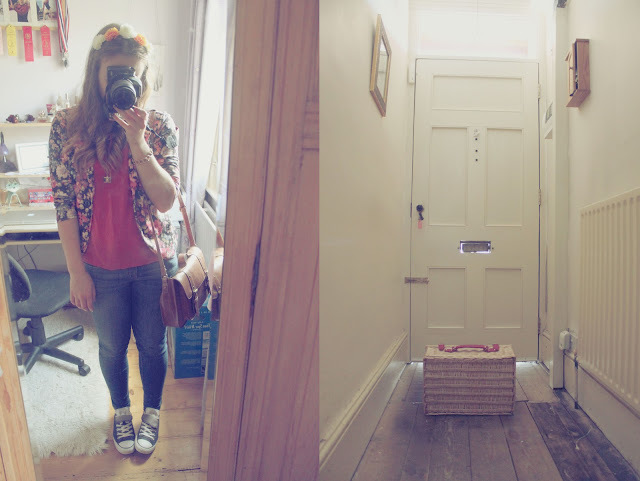 Floral crown, ASOS // Necklace, Accessorize // Bracelet, my Grandma's // Shirt, my Mum's from years ago // Jacket, Anna // Jeans, American Eagle // Bag, Matalan // Shoes, Converse from ASOS. What I wore - jewellery. The view and the hamper full of goodies. Jack just chilling out maxing relaxing all cool and one of the many pretty little flower that surrounded us. My ASOS flower crown and enjoying the picnic (I don't know what that smile is, looks kinda funny). Loving my new picnic basket and beautiful skies. Sunnies, shoes and flowers, and Jack and me on a huge boulder we found.